Each year in the United States, nearly 80,000 people are diagnosed with kidney failure, a serious condition in which the kidneys fail to rid the body of wastes. Kidney failure is the final stage of a slow deterioration of the kidneys, a process known as nephropathy. Diabetes is the most common cause of kidney failure, accounting for more than 40 percent of new cases. Even when drugs and diet are able to control diabetes, the disease can lead to nephropathy and kidney failure. Most people with diabetes do not develop nephropathy that is severe enough to cause kidney failure. About 16 million people in the United States have diabetes, and about 100,000 people have kidney failure as a result of diabetes. People with kidney failure undergo either dialysis, which substitutes for some of the filtering functions of the kidneys, or transplantation to receive a healthy donor kidney. Most U.S. citizens who develop kidney failure are eligible for federally funded care. In 1997, the Federal Government spent about $11.8 billion on care for patients with kidney failure. The deterioration that characterizes kidney disease of diabetes takes place in and around the glomeruli, the blood-filtering units of the kidneys. Early in the disease, the filtering efficiency diminishes, and important proteins in the blood are lost in the urine. Medical professionals gauge the presence and extent of early kidney disease by measuring protein in the urine. Later in the disease, the kidneys lose their ability to remove waste products, such as creatinine and urea, from the blood. Measuring these waste products in the blood gives an indication of how far kidney disease has progressed. Symptoms related to kidney failure usually occur only in late stages of the disease, when kidney function has diminished to less than 10 to 25 percent of normal capacity. For many years before that point, kidney disease of diabetes is a silent process. Scientists have described five stages in the progression to kidney failure in people with diabetes. The flow of blood through the kidneys, and therefore through the glomeruli, increases--this is called hyperfiltration--and the kidneys are larger than normal. Some people remain in stage I indefinitely; others advance to stage II after many years. The rate of filtration remains elevated or at near-normal levels, and the glomeruli begin to show damage. Small amounts of a blood protein known as albumin leak into the urine--a condition known as microalbuminuria. In its earliest stages, microalbuminuria may not be detected on each evaluation. But as the rate of albumin loss increases from 20 to 200 micrograms per minute, the finding of microalbuminuria becomes more constant. (Normal losses of albumin are less than 5 micrograms per minute.) A special test is required to detect microalbuminuria. People with type 1 and type 2 diabetes may remain in stage II for many years, especially if they have good control of their blood pressure and blood glucose levels. The loss of albumin and other proteins in the urine exceeds 200 micrograms per minute. It now can be detected during routine urine tests. Because such tests often involve dipping indicator strips into the urine, they are referred to as "dipstick methods." Stage III sometimes is referred to as "dipstick-positive proteinuria" (or "clinical albuminuria" or "overt diabetic nephropathy"). Some patients develop high blood pressure. The glomeruli suffer increased damage. The kidneys progressively lose the ability to filter waste, and blood levels of creatinine and urea-nitrogen rise. People with type 1 and type 2 diabetes may remain at stage III for many years. This is referred to as "advanced clinical nephropathy." The glomerular filtration rate decreases to less than 75 milliliters per minute, large amounts of protein pass into the urine, and high blood pressure almost always occurs. Levels of creatinine and urea-nitrogen in the blood rise further. The final stage is kidney failure. The glomerular filtration rate drops to less than 10 milliliters per minute. Symptoms of kidney failure become apparent. These stages describe the progression of kidney disease for most people with type 1 diabetes who develop kidney failure. For people with type 1, the average length of time required to progress from onset of kidney disease to stage IV is 17 years. The average length of time to progress to kidney failure is 23 years. Progression to kidney failure may occur more rapidly (5-10 years) in people with untreated high blood pressure. If proteinuria does not develop within 25 years, the risk of developing advanced kidney disease begins to decrease. Type 1 diabetes accounts for only 5 to 10 percent of all diagnosed cases of diabetes, but type 1 accounts for 30 percent of the cases of kidney failure caused by diabetes. There are two types of diabetes mellitus. In patients with either type, the body does not properly process and use certain foods. The human body normally converts carbohydrates to glucose, the simple sugar that is the main source of energy for the body's cells. To enter cells, glucose needs the help of insulin, a hormone produced by the pancreas. When a person does not make enough insulin, or the body does not respond to the insulin that is present, the body cannot process glucose, and it builds up in the bloodstream. High levels of glucose in the blood or urine lead to a diagnosis of diabetes. 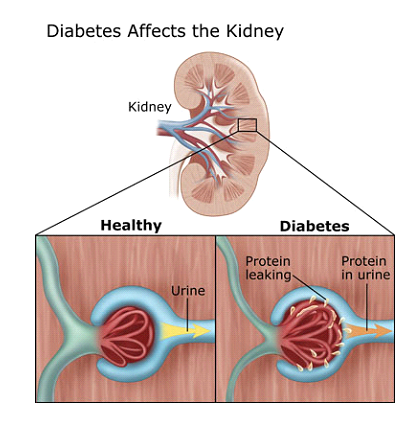 Both types of diabetes can lead to kidney disease. Only about 1 in 20 people with diabetes has type 1 diabetes, which tends to occur in young adults and children. Type 1 used to be known as insulin-dependent diabetes mellitus (IDDM) or juvenile diabetes. In type 1 diabetes, the body produces little or no insulin. People with type 1 diabetes must receive daily insulin injections. Type 1 diabetes is more likely to lead to kidney failure. About 40 percent of people with type 1 develop severe nephropathy and kidney failure by the age of 50. Some develop kidney failure before the age of 30. In 1997, the National Heart, Lung, and Blood Institute issued new blood pressure goals specifically for people with diabetes and people with renal insufficiency in the Sixth Report of the Joint National Committee on Prevention, Detection, Evaluation, and Treatment of High Blood Pressure (JNC VI). In JNC VI, the committee recommends that people with diabetes keep their blood pressure at 130/85 or lower and that people with renal insufficiency (proteinuria greater than 1 gm/24 hrs) keep their blood pressure at 125/75 or lower. Scientists have made great progress in developing methods that slow the onset and progression of kidney disease in people with diabetes. Drugs used to lower blood pressure (antihypertensive drugs) can slow the progression of kidney disease significantly. One kind of drug, angiotensin-converting enzyme (ACE) inhibitors, has proven effective in preventing progression to stages IV and V. Diuretics, beta-blockers, adrenergic nervous system modulators, and calcium channel blockers also may enhance blood pressure control in patients with diabetes mellitus. Any medicine that helps patients achieve a blood pressure target of 125/75 or lower provides benefits. Patients with even mild hypertension or persistent microalbuminuria should consult a physician about the use of antihypertensive medicines. A diet containing reduced amounts of protein may benefit people with kidney disease of diabetes. In people with diabetes, excessive consumption of protein may be harmful. Experts recommend that most patients with stage III or stage IV nephropathy consume limited amounts of protein. Antihypertensive drugs and low-protein diets can slow kidney disease when significant nephropathy is present, as in stages III and IV. A third treatment, known as intensive management of blood glucose or glycemic control, has shown great promise for people with type 1 and type 2 diabetes, especially for those in early stages of nephropathy. Intensive management is a treatment regimen that aims to keep blood glucose levels close to normal. The regimen includes frequently testing blood glucose, administering insulin frequently throughout the day on the basis of food intake and exercise, following a diet and exercise plan, and frequently consulting a health care team. Some people use an insulin pump to supply insulin throughout the day. The DCCT, conducted from 1983 to 1993, involved 1,441 participants who had type 1 diabetes. Researchers found a 50 percent decrease in both development and progression of early diabetic kidney disease (stages I and II) in participants who followed an intensive regimen for controlling blood glucose levels. The intensively managed patients had average blood glucose levels of 150 milligrams per deciliter--about 80 milligrams per deciliter lower than the levels observed in the conventionally managed patients. 1. Have your doctor measure your hemoglobin A-1-c level at least twice a year. The test provides a weighted average of your blood glucose level for the previous 3 months. Aim to keep it at less than 7 percent. 2. Work with your doctor regarding insulin injections, medicines, meal planning, exercise, and blood glucose monitoring. 3. Have your blood pressure checked several times a year. If blood pressure is high, follow your doctor's plan for keeping it near normal levels. Aim to keep it at less than 130/85. If you have proteinuria, aim to keep your blood pressure at less than 125/75. 4. Ask your doctor whether you might benefit from receiving an ACE inhibitor. 5. Have your urine checked yearly for microalbumin and protein. If there is protein in your urine, have your blood checked for elevated amounts of waste products such as creatinine. 6.Ask your doctor whether you should reduce the amount of protein in your diet. Ask for a referral to see a registered dietitian to help you with meal planning.